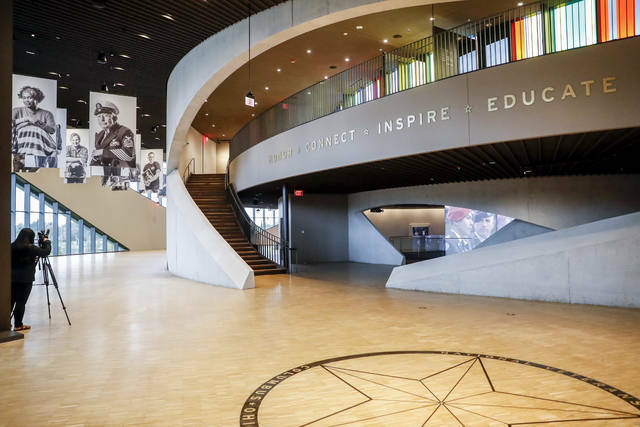 COLUMBUS, Ohio (AP) — Step lightly between two facing mirrors at a first-of-its-kind museum honoring and celebrating the experiences of military veterans, and it takes your breath away. Behind and in front of you, as far as the eye can see, are folded flags. You are standing midstream among the tidy triangles of past and future, the men and women who gave and will give their lives in service to the United States. This remembrance gallery is basked in sprays of color arranged on the windows, like stained glass, in the patterns of military service medals. 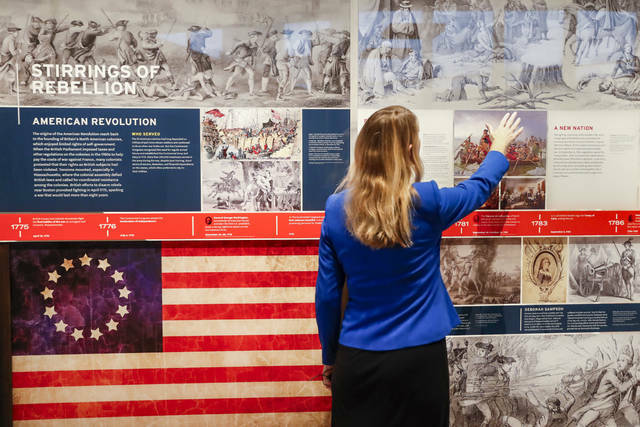 Developers of the $82 million, 53,000-square-foot National Veterans Museum and Memorial, which opened Saturday on Columbus’ downtown riverfront, seek to inspire and educate visitors with this and other inventive interactive displays. It shows military families cleaved and reunited, it visually visits young recruits aboard military vessels, it tells love stories, it mourns wrenching losses. All this is done through state-of-the-art interactive graphics, shifting photo images, documentary-style videos, oral history interviews and other engaging approaches. General Colin Powell, the former secretary of state and chairman of the Joint Chiefs of Staff, serves as honorary chair of the museum’s board of advisers. He said during opening ceremonies that by delving into what inspires veterans to serve, the nation can begin to heal. The museum is neither a war memorial nor a traditional military museum, said Amy Taylor, chief operating officer of the Columbus Downtown Development Corp., which spearheaded the effort. The goal is to show veterans’ individual lives before, during and after they serve. The structure’s sweeping concrete arches have drawn attention by designers, as well. Architectural Digest dubbed the museum one of the most anticipated buildings of 2018. Taylor said its lack of internal supporting columns is symbolic. “The strength comes from within, which we thought was appropriate for veterans,” she said. Congress also has taken note. 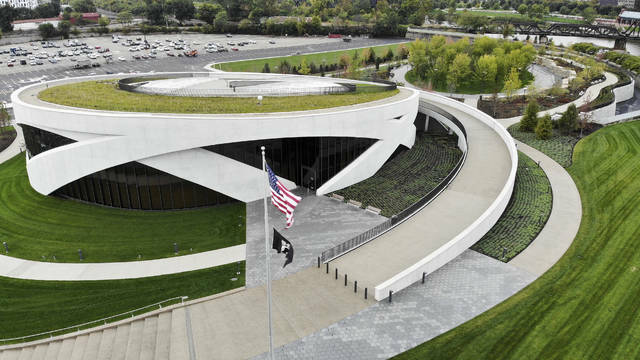 In June, the facility was designated the nation’s veterans memorial and museum. Glenn is among dozens of veterans famous and obscure whose stories — at turns, poignant, intimate, or inspiring — are shared throughout the building. His son, David, said during Saturday’s opening that his father’s training taught him to value the lives of others at least as much as his own. Another featured veteran is Tom Moe, a former state veterans’ services director under Republican Ohio Gov. John Kasich who spent more than five years as a prisoner of war in Vietnam. Moe downplayed his own experience during a recent visit to the museum, instead focusing on his wife — who worked and raised their daughter alone while he was imprisoned — and on a “special friend” memorialized at the museum, the late Sen. John McCain. The museum also remembers those who don’t come home. A quiet, 2.5-acre grove whose waterfall is visible from the museum foyer is meant for reflection and remembrance. Leslie Wexner, the billionaire founder, chairman and CEO of L Brands, was a key backer of the museum project. He said Saturday that another building extending the museum’s educational and community efforts is envisioned. Taylor said its developers hope the museum’s location in the Midwest will allow many of the 21 million living veterans to make pilgrimages to the site, or interact through its website and community efforts. More information is available at: http://www.nationalvmm.org. AP reporter Angie Wang in Cincinnati contributed to this report.